Since their invention in the early 1700s, High Intensity Discharge (HID) lights have become the dominant technology in horticultural lighting. These lights put out huge amounts of light and their spectrum is close enough to the sun to be effective in plant growth. This is the leading technology in indoor horticulture today but there is a new champion on the rise – LEDs are well positioned to take over the leading role in this market as we move further into the 21st century. In terms of lumens per watt, today’s double ended HPS lights are quite efficient compared to other types of traditional artificial lighting, producing over a 100 lumens per watt. 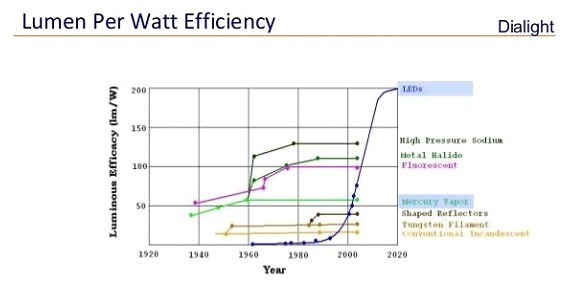 However, when we consider LEDs, light output has already exceeded 300 lumens per watt in the lab. 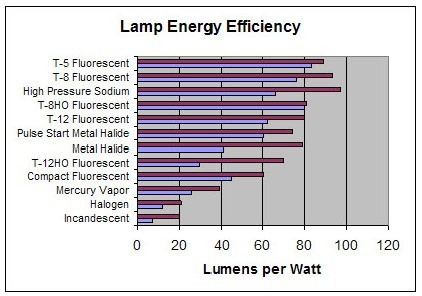 Like most electronics, LEDs continue to increase in efficiency and decrease in cost per lumen of output. If for no other reason, this gain in efficiency will eventually spell the end of older has bulb technologies such as HID lighting. LED s are clearly the lighting technology of the future. The process of creating light with HID lamps is extremely efficient, with HPS DE lamps running as high as 1.7umol/j (#photons out / joules of energy in). But the process of directing that light down to the area where it will be used is not so efficient, for it requires a reflector fixture. The very best reflective materials used in fixtures run around 95% total reflectivity. This means that every time light strikes that surface, 95% reflects off and 5% absorbs and is converted to heat. The more a light source(lamp) diverges from a true “point-source,” the harder it is to design a reflector fixture that gets every photon out of the fixture in one reflection. With a large diffused light source like an HID lamp, it often it can be many reflections, and with each reflection you lose at least 5%. So even the best HID fixtures typically have an overall fixture efficiency of 85% or less. That means a 1.7 mmol/joule rating of a DE HPS lamp is effectively 1.45mmol/joules when actually directed towards the canopy. Since LEDs are directional they require not reflectors and therefore do not have this limitation. The output of HID lamps can degrade as much as 10-15% after only one year of operation, and in the case of HPS, as they degrade, the spectrum shifts toward the Green/Yellow range, which is the range of spectrum most poorly utilized by plants. (An even greater spectral SHIFT occurs when dimming an HPS lamp, so dimming HPS in horticultural applications is not recommended.) For this reason, most professional growers replace their HID lamps a minimum of once every year and many even replace them every 2 harvests, with significant on-going lamp ($50-$70) and labor (the most commonly overlooked) expense. LEDs are rated at for at least 50,000 hours with less than 10% drop in output and often continue to operate way beyond their rating with little or no shift in spectrum. HID Lamps have an interior wall temperature around 400 degrees Celsius, so they can be potential fire hazards if not applied and cooled properly. Many city and county safety codes are beginning to prohibit the use of HID systems in residential indoor grows due to the dramatic increase in “closet fires”. Roughly 75% of all the energy consumed by an HID lamp is emitted as heat, and most of that heat is in the form of Infra-Red (IR) radiation. So not only do HID systems require significant air-conditioning, but the high levels of IR heat the leaves without raising the air temperature, and this differential can cause localized heat stress, fox-tailing, and other heat related problems even when the room air temperature is in a safe range. LEDs typically emit 50% less head compared to HIDs. Furthermore, most heat from LEDs is generated from the back of the circuit boards and passed on to the heat sinks rather than being radiated towards the plants. Plants absorb light and use the photons energy to strip the hydrogen out of water and combine it with the carbon from the Carbon Dioxide in the air (plus relatively small amounts of soil minerals) to create plant matter. They have several pigments that can absorb light and fuel plant processes, but far and away the most prevalent and efficient pigment for photosynthesis is Chlorophyll. As you can see from this graph, there are two forms of Chlorophyll called Chlorophyll A and Chlorophyll B. Each has absorption peaks in both the Red and Blue spectrums, and both reflect yellow and green, (giving plants their green color,) so while the green/yellow bands can be absorbed by other pigments like the Carotenoids, over 50% of this spectrum range is reflected away and/or poorly utilized. This graph shows plant absorption throughout the PAR spectrum range. As you can see, absorption right around the green/yellow boundry is as low as 30% and from 620 (range/red boundry) to 520 (Blue/Green boundry) is completely under 50%. There are other pigments besides Chlorophyll that can absorb and utilize this spectrum range but they are far less efficient and typically located deeper in the leaf because they get most of their photons from light that is reflected off the leaves and bounces deeper into the canopy and is absorbed through the bottom of the leaves. Metal Halide differs from HPS in the fact that the spectrum bands are generated by individual Metal Halides, for example a green halide, blue halide and red halide, which turn to gas and emit light when heated. So the MH spectrum can be blended much like Phosphors in Fluorescent lamps or LEDs. But the efficiencies of the individual halides vary and the red halides are the least efficient, most expensive, and most reactive, i.e. shortest lived. So Metal Halide lamps have traditionally favored the blue end of the spectrum, for as the lamp light gets “warmer” in color — i.e. generates more red — they get less efficient, more expensive, and degrade faster. And as you can see from the graphs they still produce minimal amounts of far red at the critical 675nm Chlorophyll A peak. So historically, Metal Halide lamps, even the new and highly touted Ceramic Metal Halide lamps have been used primarily for Vegetation phases of growth, where the red spectrum is less important, and possibly for the last 2 weeks of ripening. LEDs are the only lighting technology that can be designed to meet specific light spectrums for plants. Individual LED chips produce very narrow spectrum bands, so LED grow-lights can be precisely mixed to deliver a spectrum that is optimized for maximum plant absorption and utilization. And it is this ability to deliver exactly those frequencies the plant uses best, and all at very high efficiencies, that allow the most recent generation of top-tier LED grow-lights to deliver comparable yields and often superior quality to that produced by HID lamps with 30-40% less input power. There is no such thing as a “white” LED. White LED “packages” come in 2 forms, first and least common is a package that puts a red, green, and blue LED chips together in one device with the 3 chips mixing to white. But green LED’s are expensive and inefficient, so by far the most common “White” LEDs are a hybrid system consisting of a blue LED chip with a primary lens coated with phosphors. So they are in reality a miniature fluorescent lamp, except that instead of using the UV and Blue light from mercury vapor to stimulate the phosphors, they use light from a blue LED. White LED’s are quite efficient, because even though there are conversion losses when using phosphors, the Blue LEDs are the most efficient LED’s currently available. So the overall efficiency of the White LEDs falls right in the middle between the blue and red LEDs. But White LEDs suffer the same limitation as Fluorescents, namely that the red phosphors are less efficient, so White LEDs tend to be more efficient the “cooler white” or more blue dominant they are. And to be truly “white” they still need to produce a significant amount of green spectrum—and all at utilization rates of <50%. So in general, White LEDs are better suited for Vegetation phases of growth than for Flowering, which favors Red spectrums for optimal yields. But more on that later. The Best LED designs for Flowering (including the California LightWorks products) use an approach called Hybrid Spectrum. In this design, the majority of the light output is generated in 4 spectrum bands aligning with the 4 Chlorophyll peaks, and then a smaller percentage, usually around 10-20% is provided by White LEDs (the kind with the phosphors). The White LEDs provide roughly 30% of their light in the middle spectrum of green / yellow to supply photosynthetic activity to the other pigments such as the Carotinoid system, as well as providing full spectrum light to make plant inspection easier without the green LED glasses. California LightWorks products all incorporate the state-of-the-art Osram SSL Horticultural LED platform in this Hybrid approach. The Osram SSL platform has 5 extremely high efficiency 3w LEDs: Deep Blue (Blue chlorophyll A peak), Blue (Blue chlorophyll B peak), White (RGB), Red (Red chlorophyll B peak) and Far Red (FR chlorophyll A Peak). All the SSL family of LEDs have state-of-the-art ceramic substrates for superior heat conductivity and mechanical stability. The heat conductivity of the substrate is the key to LED efficiency and life and this new ceramic material is far superior to the older plastic substrates still in common use in most of our competitors Horticultural LED systems. Another well understood example of Photomorphogenesis is the Short Day (and Long Day) flower responses, where the ratio of the hours of red absorption vs. hours of darkness triggers flowering. The Cannabis family are Short Day flowering plants. While there is little actual University research data on the morphogenic effects of variations in the ratio of Red vs Blue in Cannabis specifically, the basic effects are fairly well understood. A higher ratio (>60%)of Red in the spectrum mix tend to promote stem, and flower production in Cannabis and many other plants. A higher ratio (>40%) of Blue light promotes leaf, resin, and terpene (fragrance) production, as well as stimulating other pigments which can bring out more pronounced colors in the flowers. Again, this is known from the results of various studies with other plants as well as from experience in professional cannabis circles, but no formal tests have been done with cannabis in this regard to this authors knowledge. A practical example of the effect of higher red ratios can be found in the difference between Indoor Cannabis under HPS, and outdoor or greenhouse grown Cannabis. Indoor (HPS) flower tends to be denser, with less flower (sugar) leaves. The flower leaves are literally just little tips extending from the flowers. Outdoor or Greenhouse flower tends to be less dense, and has significantly more and larger flower leaves. This effect has literally resulted in a differential of 2x in the value of the end product, with top-tier indoor flower in Colorado selling for twice the price of outdoor flower. The same has held in California over a decade. And it’s important to remember, this holds true even with all the other factors, i.e. temperature, nutrients, soil etc.., held equal. The market value is STILL 50% less for outdoor, and the ONLY difference is that Sunlight has a significantly higher ratio of Blue to Red when compared with HPS. The fragrance and resin production in outdoor are still very good, but the overall shelf appeal is dramatically lacking. And understand, this is not a judgment on the quality or effectiveness or Indoor vs. outdoor, only in the well defined difference in market value. Many people will suggest Outdoor is better, but people are willing to pay substantially more for COSMETICALLY better flower. Master growers from California to Canada have also discovered that switching back to blue-rich metal halide lamps during the last 2 weeks of flower (referred to as the “Ripening” or” Finishing” period) significantly stimulates resin and terpene production in Cannabis. It is not a common practice however because it is a major hassle to change HID lamps in fixtures (especially ventilated ones) over the tops of a nearly finished flowering canopy. Fortunately, with the California LightWorks LED systems, it is as easy as just pressing a switch (In the case of the SS440/880) or touch screen (in the case of the 550) to adjust the spectrum for growing periods independently and use Photomorphogenesis to your advantage. And fully customized spectrum mixes for Veg, Pre-flower, Flower, and especially “Ripen” periods are just a few keystrokes away with the programmable SolarSystem 550 controller. So only the Hybrid LED approach with independent spectrum control allows you to tailor the spectrum mix not only to increase efficiency but also to effectively control the plants growth (morphology), and consequently the yield and quality of the end product. In 1983, the University of Maryland conducted a study to measure the changes in THC levels (and CBD) of Cannabis Sativa plants grown indoors under HPS vs. identical plants indoors under HPS, but supplemented with 4 different levels of UVB light supplied by mercury vapor based UVB lamps. The UVB levels ranged from Zero (0) UVB on the low end, to Equatorial Sun levels UVB on the high end, and a couple increments between. The results were quite remarkable. The baseline Cannabis Sativa plants with no UVB measured 25% THC. The plants at Equatorial sun level UVB measured 33% THC. That’s over a 30% increase in THC levels by just supplementing UVB light throughout the growth cycle (CBD levels did not change). This study was what prompted California LightWorks to be the first and only LED grow-light company to integrate mercury-vapor UVB lamps in their SolarStorm LED grow-light line with great success. Do not let our competitors fool you with claims of “UV” in their products supplied by LEDs. UV LED’s are EXTREMELY expensive and inefficient, and completely impractical for use in grow-lights. The UV our competitors refer to is UVA, NOT UVB, and it is provided in ANY LED fixture that uses the Deep Blue LEDs because the very low end of the Deep Blue spectrum band overlaps slightly into the very top of what is considered the UVA range. This has allowed them to rather disingenuously claim their fixtures supply “UV”. But understand, it is only UVA, and only in miniscule amounts that will have absolutely NO measurable effect on THC levels. Mercury vapor is the only legitimate system for UVB supplementation available today, and it is only found in the California LightWorks product line. The last really compelling advantage of LED’s is simplicity and ease of use. LEDs have NO lamps to replace, ever, have 40-50% less cooling requirements than un-ventilated HID systems. They create absolutely NO fire hazard in the close quarters of grow tents, and they generate very little growth stratifying infra-red (IR) radiation. So while skepticism regarding LED’s for Flowering still exists in the smaller prosumer segment of the cannabis market, there is growing and widespread acceptance for the newest generation of the top LED products amongst the bigger commercial players. When business people consider the energy savings, the reliability, the lack of lamp maintenance, independent spectrum control and advanced capabilities such as the ability to dim levels up and down using photocells for varying sun levels in greenhouses, and all with similar yields and higher quality end product, the decision is fairly straight forward. And it is for all these reasons that the current generation of LED grow-lights are finally poised to permanently replace HID as the first choice for Horticultural lighting.